Ok, so this isn’t a post about the famous confection turkish delight, made even more recognisable from the Lion, the Witch, and the Wardrobe. In fact, this post would be better titled “Turkish delights!” Notice the change in capitalisation and the pluralisation… ok, anyways…. A friend of mine is majoring in Turkish at the University of Utah. His girlfriend (a very good friend of mine), introduced me to Turkish gata. Gata is a flaky little pastry with a sweet, buttery filling. Apparently it is also known as Armenian Sweet Bread. Well, that’s all semantics to me. IT’S GOOD, so who cares where it comes from?! In a mixing bowl, combine the yeast and sour cream; set aside for 10 minutes. Add melted butter and mix well. And egg, oil, and vinegar and mix well. Gradually add the flour and mix until a soft dough forms. Knead dough on a floured surface for 15 minutes, adding more flour so it doesn’t stick. Form the dough into a ball, cover in plastic wrap, and refrigerate overnight. To make the filling, mix butter, flower, sugar, and vanilla vigorously. It should not stick to your hands. Preheat the oven to 350 degrees F. Remove dough from the refrigerator, divide it into 8 equal balls. Roll out each ball to a 10″x6″ rectangle. Paint each rectangle with the melted butter, spread the filling over each rectangle. Fold in about ½” on each side of each rectangle. Roll up each rectangle to form eight 10″ long cylinders. Cut each cylinder into thirds. Place on a greased cookie sheet seam side down. Combine the egg yolks and yogurt to form a glaze, and brush the glaze of the top of each pastry. Bake for approximately 24 minutes, until golden brown. 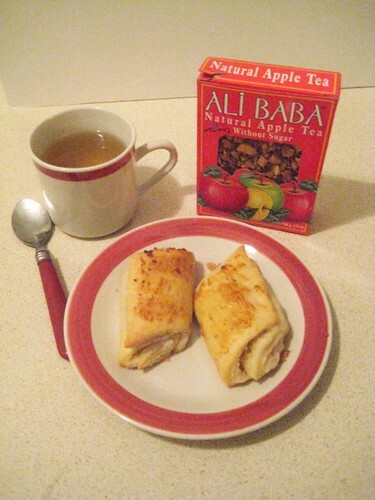 After baking the gata, I let the pastries cool, and then had a few with some Ali Baba’s Turkish Apple tea a student of mine got me from her trip to Turkey. SOOOOOOOOO GOOOOD! If I were to do anything, I’d use real vanilla beans (or maybe some crushed cardamom pods! ), and include more yogurt in the glaze. The yogurt gives a sweet, tangy flavour to the pastry. While the pastry was good fresh out of the oven, it was PHENOMENAL a day later. 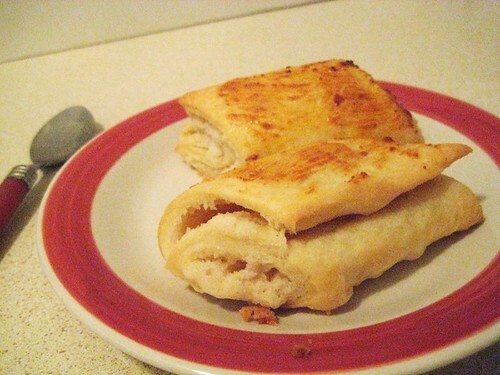 So, if you bake this, and you can resist temptation, let them sit overnight (covered, of course), and you won’t regret it. YUM!